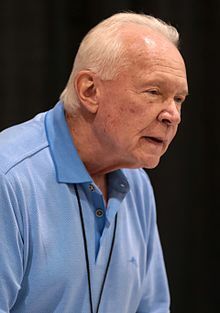 For the American basketball player, see Terry Brooks (basketball). Terence Dean Brooks (born January 8, 1944) is an American writer of fantasy fiction. He writes mainly epic fantasy, and has also written two movie novelizations. He has written 23 New York Times bestsellers during his writing career, and has over 21 million copies of his books in print. He is one of the biggest-selling living fantasy writers. Brooks was born in the rural Midwestern town of Sterling, Illinois, and spent a large part of his life living there. He is an alumnus of Hamilton College, earning his B.A. in English literature in 1966. He later obtained a law degree (J.D.) from Washington and Lee University. He was a practicing attorney before becoming a full-time author. Brooks had been a writer since high school, writing mainly in the genres of science fiction, western, fiction, and non-fiction. One day, in his early college life, he was given a copy of J. R. R. Tolkien's The Lord of the Rings, which inspired him to write in one genre. While Tolkien inspired the genre, Brooks stated during his TEDxRainier talk "Why I Write about Elves", as well as at the Charlotte Literary Festival that he credits the inspiration of his style of writing to William Faulkner's works. With this inspiration, he then made his debut in 1977 with The Sword of Shannara. After finishing two sequels to The Sword of Shannara, Brooks moved on to the series which would become known as the Landover novels. Brooks then wrote a four-book series titled The Heritage of Shannara. For the next fourteen years, he wrote more Landover books, then went on to write The Word and Void trilogy. Continuing the Shannara series, Brooks wrote the prequel to The Sword of Shannara, titled First King of Shannara. He then wrote two series, The Voyage of the Jerle Shannara and High Druid of Shannara and recently finished a third, Genesis of Shannara, a trilogy bridging his Word and Void and Shannara series. The sixth book in the Landover series, A Princess of Landover, was released in August 2009. Returning to Shannara, a duology, Legends of Shannara, taking place after the events of Genesis of Shannara, was written next. The first book, entitled Bearers of the Black Staff, was released in August 2010 and the second, The Measure of the Magic, was released in August 2011. He next completed a trilogy entitled The Dark Legacy of Shannara. The three books are; Wards of Faerie (Feb 2013), Bloodfire Quest (June 2013), and Witch Wraith (Dec 2013). He followed this with the trilogy Defenders of Shannara, which include The High Druid's Blade (July 2014), The Darkling Child (June 2015), and The Sorcerer's Daughter (May 24, 2016). According to his website, he is currently working on the final and concluding tetralogy of the Shannara series known as The Fall of Shannara. The first book in the tetralogy is The Black Elfstone and was released on June 13, 2017. A television series based on the Shannara works, entitled The Shannara Chronicles began showing on MTV in January 2016. The show starts with the second book of the original series, Elfstones, as there are strong female roles which did not appear in the first book. The second season aired in 2017 on SPIKE  On January 16, 2018, it was announced that the series had been cancelled after two seasons. Producers later announced that the series is being shopped to other networks. Brooks resides in Seattle, Washington with his wife, Judine. I find it much harder to write short stories than long fiction. I feel cramped by the lack of space and the dictates of the form. There is considerable difference in long and short fiction disciplines, and I am not good with the latter. I hope not to have to do many more of them, but you never know. I must have written Indomitable anywhere from four to five times, each effort different. Give me a five hundred page sprawl as an assignment any day. ^ Speakman, Shawn (2008). 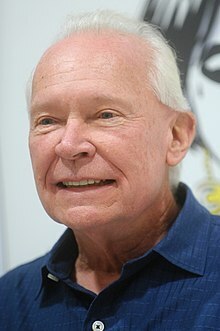 "Terry Brooks' official website". Archived from the original on April 23, 2008. Retrieved May 19, 2008. ^ "Studio plans Shannara film series". BBC News. June 6, 2007. Archived from the original on September 7, 2015. Retrieved September 7, 2008. ^ a b Brooks, Terry. "Why I Write about Elves". tedxtalks.ted.com. Archived from the original on October 19, 2014. Retrieved December 14, 2012. ^ "Terry Brooks: MTV is Doing The Shannara Chronicles Right". pastemagazine.com. Archived from the original on August 28, 2017. Retrieved May 9, 2018. ^ "MTV Renews The Shannara Chronicles For Second Season". mtv.com. Archived from the original on November 6, 2017. Retrieved May 9, 2018. ^ Petski, Denise (January 17, 2018). "'The Shannara Chronicles' Canceled After Two Seasons". Deadline. Archived from the original on January 17, 2018. Retrieved January 17, 2018. ^ Andreeva, Nellie (January 17, 2018). "'The Shannara Chronicles' Shopped To Other Networks For Season 3". Deadline. Archived from the original on January 17, 2018. Retrieved January 17, 2018. ^ Brooks, Terry (1999–2008). "Ask Terry Q&A - Writing". Archived from the original on September 14, 2012. Retrieved September 14, 2008.